Have you ever been in the middle of a conversation you wanted to escape? Like when the person you are talking to has such horrible breath, you think you are going to be sick? Bad breath is repulsive and can be the reason others may be avoiding you. In order to control bad breath, it is important you stay on top of your personal hygiene habits, watch what you eat, and make sure you always get your routine trip to the dentist in. Below are a few reminders of what you should be doing on a daily basis to combat bad breath. First and foremost, keep up with your daily brushing and flossing. Regular brushing and flossing removes food particles from your mouth, which can get stuck between the crevices of your teeth and rot. Leftover food particles in your mouth can also cause bacteria to accumulate, causing a foul smell. Brush at least twice a day for two-three minutes at a time, or after every time you eat. Also, be sure to brush your tongue as well as your teeth. Your tongue needs to be cleaned just as much as your teeth do. Then, replace your toothbrush at least every three to six months, or when the bristles appear to be worn out. Staying hydrated is important for your health and day to day functionality. Did you know that drinking lots of water also helps to fight against bad breath? When you are constantly drinking water, it helps to flush your mouth out and keep your pallet clean. Drinking lots of water doesn’t give sugars, acids, or bacteria in your mouth long enough time to sit on your teeth to wreak havoc. What you eat and drink impacts how your breath smells. Certain foods and substances contribute to your bad breath, and some are worse than others, which you’ll want to limit or avoid completely. You should abstain from tobacco, alcohol, and coffee as they are hard on your teeth and cause terrible breath. Sugary or acidic foods can also be the source of bad breath, and should be eaten in moderation. When possible, try to brush after each time you eat to keep your breath fresh and clean. If you are unable to brush after eating, even chewing gum can help to trigger saliva to flush your mouth out and mask the smell of bad breath. Sometimes bad breath remains even after being dutiful about brushing and flossing. Before you give up completely, schedule a trip to the dentist. Bad breath might actually be the result of a medical condition, which may need some attention. If you are experiencing dry mouth, an infection, or other medical conditions stemming from the nose, throat, or mouth, our dentist can provide more permanent treatments and solutions. Give our Idaho Falls dentist a call today at (208) ­524-1700. This entry was posted in General on June 6, 2018 by Barton. Your smile is important. In fact, most Americans believe that their smile is an important social asset. Feeling comfortable with your teeth gives you an advantage when it comes time to smile. If you are worried about how your teeth appear, you may be self conscious and awkward. Most people feel more confident when their teeth are straight, white and clean. 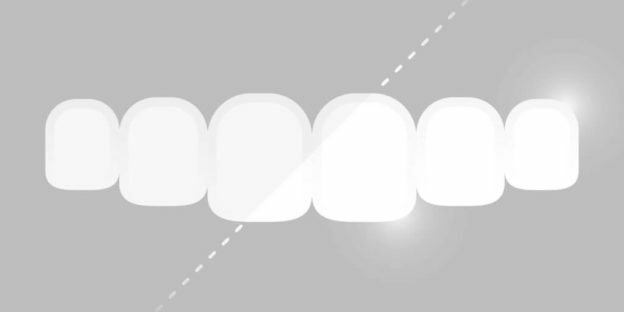 White teeth are considered more attractive than stained, discolored teeth. Choosing to whiten teeth is often a first step in improving a smile since it is pretty simple to accomplish with the help of a dentist. 99.7% of Americans believe that a smile is an important social asset. 74% of adults believe that an unattractive smile can hurt chances for career success. Genetics. You may get lucky or unlucky here. Your genetics may mean that you have strong, healthy, white teeth, or you may inherit a defect in the tooth enamel that may make it look darker or discolored. Developmental Disorders. Fevers, jaundice or other illnesses while teeth are developing can cause problems in developing enamel or make teeth discolored. Antibiotics. Use of the antibiotic tetracycline before the age of eight has resulted in discolored teeth. Tooth Decay. Decaying teeth may appear dark or discolored. Foods. Foods that contain tannin, and coffee and tea can discolor teeth. Age. Teeth naturally get darker as we age. Whitening Toothpaste. You are already brushing your teeth, it is simple enough to choose a toothpaste that will whiten as it cleans. These days, most brands offer whitening options, and it is a simple fix. Whitening Kits. There are many whitening kits that can be purchased at the store. Using these for a period of time can whiten your teeth. Prevent Stains. It is probably easiest to prevent stains in the first place. There are many foods that are known to cause stains. Avoiding these foods and other activities known to cause stains will prevent them from occurring. Smoking is known to yellow teeth. Avoid smoking, and drinking coffee, tea, and wine. Or at the very least, reduce your intake of these common stain causing drinks. Soda and sugar filled energy drinks can also cause tooth decay and staining. Chew Sugarless Gum. Chewing gum increases saliva production which in turn fights germs. Rinse Your Mouth. Even if you can’t brush your teeth between meals, rinse your mouth with water. This will keep stain causing foods from sitting on your teeth where they can seep in and cause more staining. The quickest and most effective way to get white teeth is to get a whitening treatment at your dentist’s office. Through the in-office whitening treatment, you can get your teeth ten shades whiter in as little as an hour. This is much more effective than trays and strips bought at the store that need to be used for weeks at a time. In-office whitening done by your dentist is done in a way to protect your gums and enamel, lessening the chance of tooth sensitivity. While tooth sensitivity may still occur, you can talk to your dentist for how to handle this if it arises. If you prefer to use a kit at home, your dentist may also have take home kits available. These are also more effective than what you can purchase at the store because they fit your teeth, keeping the gel from leaking in your mouth. 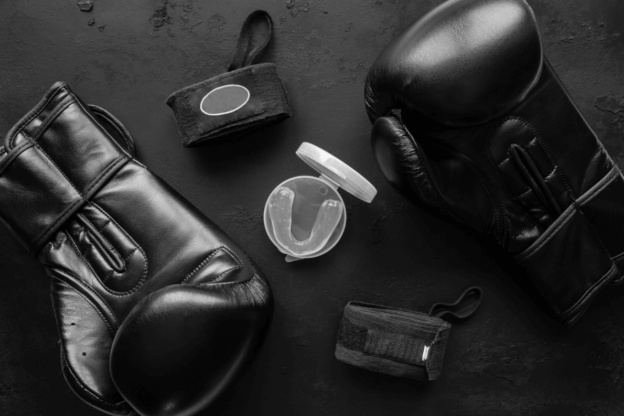 Leaking gel causes gum soreness and makes the treatment less effective. Properly fitted trays prevent that from happening. We want you to feel confident in your smile. Whiter and brighter teeth can help you smile with confidence. If you are interested in having your teeth whitened, give us a call at (208) ­524-1700 today! This entry was posted in General, Teeth Whitening on April 5, 2017 by Barton. We all know that we need to brush our teeth twice a day, floss twice a day and visit the dentist every six months. These are “must dos” for good dental hygiene. What you may not realize is that a healthy diet can have a huge impact on the health of your teeth. Eat well and enjoy strong teeth and gums. These are the absolute minimum requirements for healthy teeth. They are essential “must do” behaviors that will help keep your teeth from decaying. Brush Your Teeth Twice a Day. Morning and night. Floss Your Teeth Twice a Day. Morning and night. Visit the Dentist every Six Months. Regular check ups can catch issues before they turn into big problems. A good cleaning can help maintain strong teeth. Eat Calcium. Our teeth and gums are made up of calcium, which means we need to eat calcium to maintain healthy teeth and gums. Calcium can be found in dairy products. Make sure to eat enough cheese, milk, and yogurt to get the right amount of calcium. Get Your Vitamin D. Vitamin D helps our bodies absorb the calcium we eat. Unless we get enough vitamin D, then eating calcium isn’t enough to keep our teeth strong. We get most of our vitamin D from the sun, so get outside and soak up some rays. Don’t Forget Vitamin C. Vitamin C deficiency can lead to dental problems like loose teeth and bleeding gums. Make sure to keep gums and teeth strong by getting the proper amount of vitamin C. Vitamin C is found in citrus fruits. Drink some orange juice or eat a bit of grapefruit. Avoid Sugar. Sugar can easily lead to tooth decay, so it is best to avoid sugar whenever possible. A diet high in sugary foods is a bad choice for teeth. Skip the candy and grab some fruit instead. Drink Water. Drinking water increases saliva production which in turn can help battle bacteria. Water also dilutes sugar and cleans out your mouth. Rinse Your Mouth. Quickly rinsing your mouth between meals will remove sugar from your teeth and prevent tooth decay. If you can use mouthwash to kill germs between meals that is great. If not, rinse with water, which still cleans out your mouth and can prevent cavities. We only get one set of adult teeth that need to last the rest of our lives. Making good choices to protect our dental health will make it so that we can enjoy our teeth for a long time to come. Protecting our teeth isn’t just about brushing them twice a day. We can also maintain dental health by eating foods that will keep our teeth strong. Remember to eat healthy for a healthy smile. Proper teeth brushing, flossing and healthy eating habits are vital for maintaining dental health. 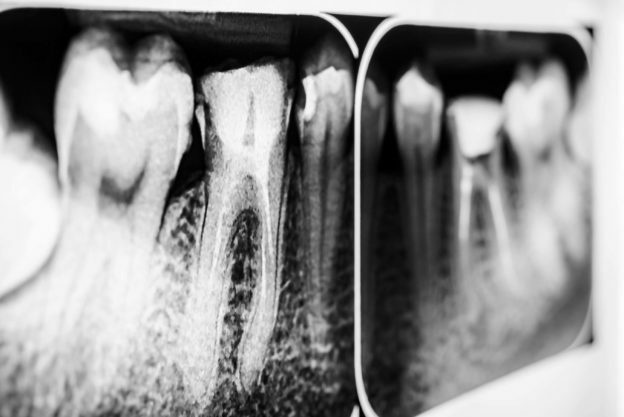 Regular checkups at our Idaho Falls dentistry are also important. Even with best efforts, we all get cavities. We can take care of any problems that arise, so that you can smile without worry. Call today at (208) ­524-1700 to set up an appointment. This entry was posted in General, Preventative Dentistry on March 27, 2017 by Barton. Getting kids to brush their teeth can be a chore that few parents look forward to. If your children are like mine, they’ve been known to run and hide as soon as the words “brush your teeth” are muttered. Little kids are rarely concerned about the future of their teeth, and many think losing a couple teeth is actually something that they wouldn’t mind. 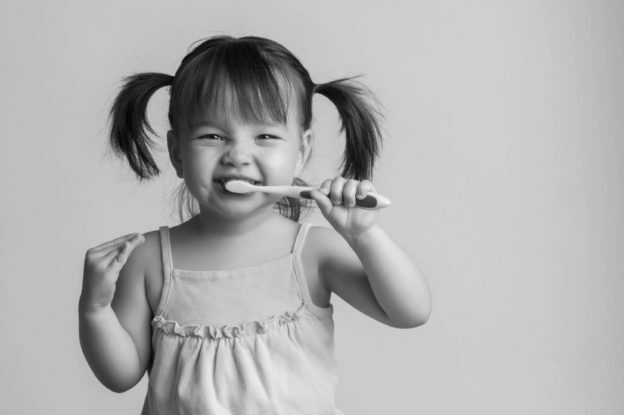 Changing teeth brushing from a chore to a positive experience can make a big difference in getting your kids to brush. 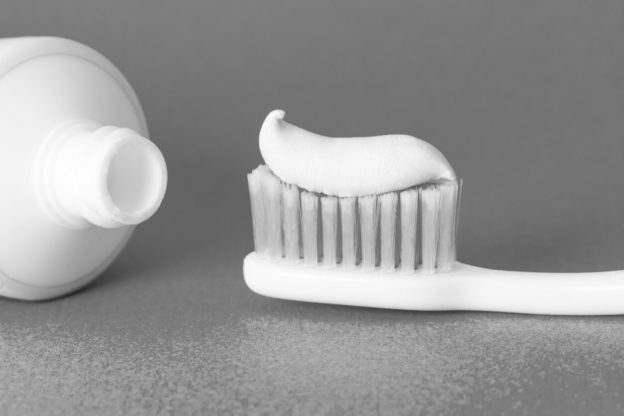 Here are a few tips for how to make teeth brushing go more smoothly. Show them the Plaque. Plaque-disclosing tablets color the plaque on your child’s teeth and allow them to really see where they need to brush. Many kids love to use these tablets and it helps them understand how to brush more effectively. There are also some mouthwashes that will tint plaque and allow kids to see where they should brush. You can find plaque-disclosing tablets at the dentist, the pharmacist’s counter and online. Making Bubbles. Have a competition with your kids to see who can make the most bubbles. This will make brushing fun and encourage them to brush more. After all, the more they brush, the more bubbles they will make. Brushing with a Stuffed Animal. Let them bring a friend to brushing time. Simply bringing a stuffed animal will make the process more fun. Maybe their friend needs his/her teeth brushed too. Singing a Song. Choose a favorite song and play it while they brush, or encourage them to sing a favorite song in their head. Using an Egg Timer. Kids love to use timers. Set up the timer and have them brush till the sand runs out. Praise Your Kids. Everyone loves to get praised. When your kids do a good job, let them know you appreciate their efforts. It takes very little effort to say a positive word, but it can make the difference in how your kids feel about teeth brushing time. Let them Pick the Toothpaste/Toothbrush. There are all types of fun toothbrushes and toothpaste. Letting your kids pick their favorite character can motivate them to brush their teeth. Sometimes all it takes to look forward to teeth brushing time is their favorite cartoon character. As parents, we are ultimately responsible for the health of our children’s teeth. Here are a few tips to help keep their teeth healthy and bright. Schedule your kid’s first appointment when they are one years old. The earlier they come in, the better. 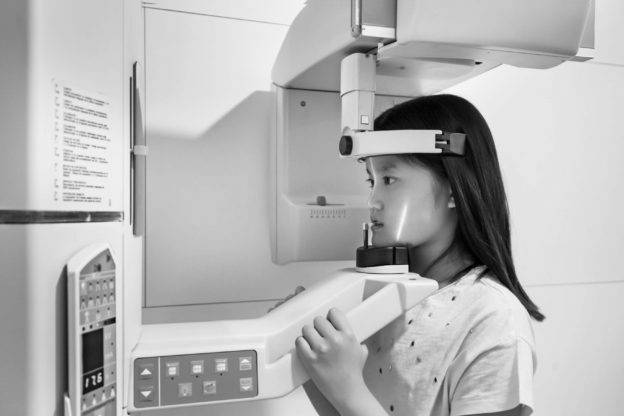 This allows them to build a positive experience at the dentist and make sure that healthy habits start when they are little. Brush your kid’s teeth twice a day. Once they begin brushing on their own, make sure to continue to check that they are doing a good job and removing all food residue. Floss your kid’s teeth as soon as they start touching. Once teeth are close together, food can easily get caught between the teeth and cause teeth to decay. If regular flossing is difficult, use child friendly flossers. Talk to your dentist about sealants. Sealants protect teeth and prevent cavities. At our Idaho Falls family dentistry, we care about our littlest patients and want them to enjoy their experience at the dentist. We strive to make their visit as comfortable as possible. Call today to make an appointment for your little ones. This entry was posted in Family Dentistry, General, Preventative Dentistry on March 27, 2017 by Barton. It’s no surprise that brushing your teeth is important for keeping your teeth clean and healthy. No doubt you’ve heard it from every dentist you’ve ever visited and also from your parents as a kid. Brush your teeth at least twice a day to keep your smile bright. Save Money. Brushing teeth is a great way to save money. Dental work is expensive, and in many cases, easily avoided. Don’t pay hundreds of dollars to fill a cavity when you can easily prevent cavities by brushing your teeth. Forgetting to brush and avoiding the dentist can lead to more expensive procedures down the road, like root canals and crowns. Save your money by brushing your teeth every day. Reduce Chance of Infection. Brushing your teeth is a simple way to reduce your chance of having an infection. 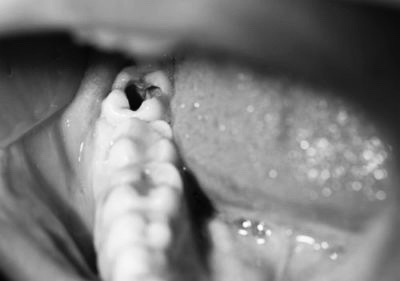 When your teeth get infected, you can get a painful abscess in your gums. Avoid the pain just by brushing your teeth. Reduces Bacteria. Bacteria in your mouth can lead to tooth decay. Brushing your teeth gets rid of these nasty bacteria that can cause decay or infection. Removes Sugar. Bacteria love the sugar in your mouth. When the bacteria feed on the sugar they create an acid that decays your teeth. Brushing your teeth will remove this sugar from your mouth before the bacteria can feast. Prevent Tooth Decay. Bacteria eat the sugar in your mouth, creating an acid that wears down your teeth causing decay known as cavities. Simply brush your teeth and reduce your chance of having tooth decay. Reduces Gum Disease. Your gums also need to be cleaned. Gum disease is painful and can be avoided, simply by–yes, brushing your teeth! Keeps Breath Fresh. Those pesky bacteria also make your breath smell. Guess what, brushing not only removes those stinky bacteria, but the fresh scent of your toothpaste helps to keep your breath minty fresh. Remove Stains. Soda, coffee, cigarettes and some foods stain your teeth. Brushing can remove those stains over time. Since we all know that we should brush our teeth everyday, it is surprising that not everyone is doing it the right way. Here are some tips for how to get the most out of brushing your teeth. Choose the Right Toothbrush. There are a lot of different choices out there for toothbrushes. Always choose a toothbrush with soft bristles. Soft bristles can bend and get under the gums. Hard bristles can wear away at teeth and gums. The important thing is to remove plaque, and soft bristles can do this just fine. Be Careful with Pressure. Many people think that it is necessary to really scrub teeth to get them clean and they apply too much pressure. Since plaque is soft, teeth don’t actually need to be scrubbed with a lot of pressure. Just like with hard bristles, too much pressure can harm teeth and gums. Gently massage teeth and gums to remove plaque. Take Your Time. It is easy to get tempted to do a rush job instead of a thorough brushing. When you wake up late and are in a hurry to get to work, or if you’ve had a long day and just want to get in bed, it is tempting to do a quick brushing. It is important to brush for at least 2 min in the morning and again before bed. Don’t rush through the brushing. Take your time and do it right. Make sure to get every tooth on both sides. Change Your Brush. Unfortunately it is common for people to keep their toothbrush for too long. Change your brush every 3 to 4 months. Never share your toothbrush with anyone else, and store it in open air so that it can dry thoroughly to prevent the growth of mold and bacteria. Circular Motion. Another common habit is for people to brush back and forth, from left to right. However, it is much better to start from the gum and move up and down in a circular motion. Remember Your Gums. A spot where many people miss is right by the gum line. It is important to have a bristles that bend and can get between the gum and tooth. This will remove the plaque that has a tendency to build up in that spot. Wait. Don’t rush to brush immediately after eating. If you have acid on your teeth, the brushing can cause additional damage. Wait 15 to 20 minutes before brushing or at least rinse with water first. This will remove some of the acid so that your teeth are not harmed. Use Floss & Mouthwash. At least once a day (twice is better), floss and use mouthwash too. Food can get stuck between teeth and your toothbrush can’t reach every sport. Floss can remove food and buildup between teeth and mouthwash can reach throughout your mouth. A good thorough cleaning is important to keep your smile bright. Brushing is important for daily care of your teeth. It is also important to visit the dentist twice a year for a cleaning and checkup. Though good brushing will make tooth decay less likely, some problems can still happen. Frequent visits keep small problems from turning into large problems. If you live in the Idaho Falls area, visit our family dentistry to keep your teeth and gums healthy. This entry was posted in Cavities, General, Preventative Dentistry, Teeth Whitening on January 12, 2017 by Barton. Soda is delicious and refreshing. In fact, it is a very popular drink. According to a Gallup poll done in 2012, nearly half of Americans drink soda every day, and according to the Associated Press in 2013 the average American drinks 44 gallons of soda in one year. That’s a lot of soda! Despite its great taste, it is bad for your teeth. 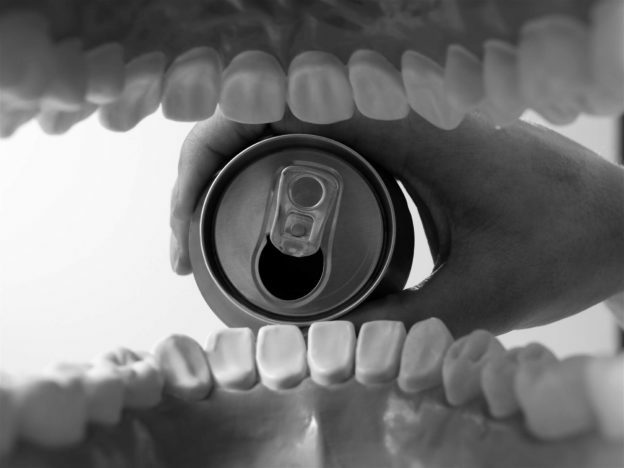 Why is Soda Bad for your Teeth? Sugar. Sugar is not a great choice for healthy teeth. Bacteria eat sugar in your mouth and release an acid that causes tooth decay, also known as cavities. Lots of sugar consumption can lead to lots of cavities. While brushing can help, it is best not to consume a lot of sugar. Your teeth and the rest of your body will thank you. Phosphoric Acid. Worse than the sugar, is that soda includes phosphoric acid. This breaks down the enamel of your teeth and can cause quite a bit of problems. Your teeth enamel plays an important part in keeping your teeth healthy. While one soda won’t do a lot of damage, frequent consumption can wreak havoc on your teeth. Staining Power. Over time soda consumption can stain your teeth and contribute to plaque build up, which is yellow in appearance. Sensitivity. Eroded enamel can cause sensitivity of the teeth. Cold and hot food and drinks can cause sensitivity and pain. It is difficult to enjoy some of your favorite foods if you can’t bear to eat anything hot or cold. Discoloration. Erosion and tooth decay can also lead to discolored teeth. No one wants to have yellow or discolored teeth. Too much soda can turn your white smile yellow. Cracking. Eventually erosion can lead to cracking because your enamel is weak. Not only does this affect the appearance of your smile, but it can also be painful and make eating difficult. What Can You to Protect Your Teeth? Use a Straw. A straw is a simple way to protect your teeth by preventing your teeth from coming into too much contact with the soda. Rinse with Water. 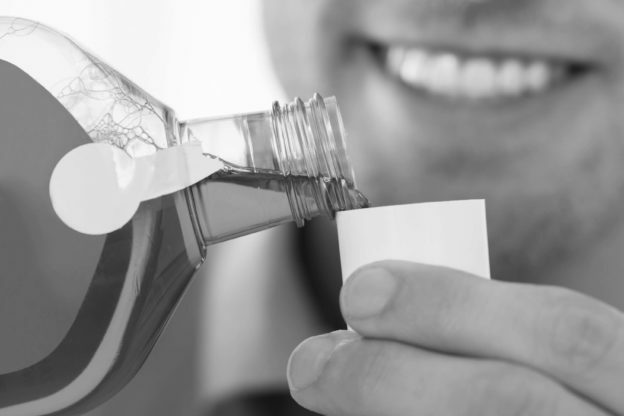 After you drink a soda, rinse with water to remove acid from your teeth. Cut Back. At least drink less soda. You can still enjoy a soda sometimes, but not everyday. Drink Water. When you would normally grab a soda, drink water instead. Water is refreshing and is good for your teeth. If you like the bubbly aspect of soda, try a carbonated water. Diet Soda has Acid Too! Diet soda cuts down on sugar, but it still has acid. While it may help cut down on calories, it is still bad for your teeth. Instead of replacing soda with a diet soda, drink more water. Wait to Brush. Immediately brushing your teeth after consuming something with acid is abrasive on your teeth. Wait 15 to 20 minutes before brushing and rinse with water first. Reducing soda intake is a great way to keep your smile bright. For more tips on how to protect your teeth, make an appointment with our Idaho Falls family dentistry. Visit with our friendly dentists to learn the best way to keep your smile bright. This entry was posted in Cavities, General, Preventative Dentistry on January 12, 2017 by Barton.